The Greatest Showman, a wholly original musical from the mind of Jenny Bick (and ushered through the big studio system via Rob "Dreamgirls" Marshall) that tells the story of P.T. Barnum (Hugh Jackman), is a weirdly fascinating experience. There were instances throughout this brisk, but admittedly epic in ambition musical that at one point might feel alarmingly slight and free of any such substance while at other points-specifically during the musical numbers-it could feel akin to a religious experience. Crazy, right? 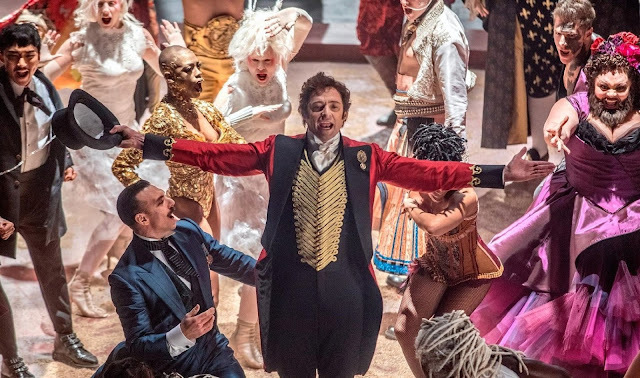 Like most things, The Greatest Showman is a balancing act, but surprisingly-so is gauging one's reaction to the film. While the film, narratively, falls into refurbished clichés of countless other rags to riches stories it also doubles down on sweeping love stories, including large themes of inclusion and tolerance for those different than what society and humanity have deemed as normal and then, somehow matches all of this up with the terms of a musical that require dance numbers, songwriting, and lyrics that both explore these aforementioned themes and narratives as well as pushing as much forward. The viewer's balancing act comes from the then aforementioned disparate elements of those cliché story beats and the rather impressive soundtrack of songs as composed by La La Land composers Justin Paul and Benj Pasek. It's so strange, even now, twenty-four hours after having seen the film and I can admittedly understand every complaint I've since read about it; sharing many of them in regards to the boxing in of Barnum's story to that of a standard Hollywood storyline. And yet, there is this undeniable aspect of the film and all the joy and hope it provides in these moments that says something about the movie, the craft behind it, and the reaction they garner. First time feature director Michael Gracey (who has mostly worked in the visual effects departments on other projects) certainly seems overwhelmed by the scope of what he has taken on here as glimpsed in both how he captures and conveys the themes as well as a majority of the musical numbers, but seriously-by the end of nearly every number and, as a result, the film-what has just occurred on screen leaves you feeling so gleeful and allows the characters to be so endearing that it's impossible to deny the appeal of The Greatest Showman despite its many, many flaws. Hugh Jackman is P.T. Barnum in The Greatest Showman. Beginning by outlining the rags part of the riches story with a flashback to that of Barnum when he was a young child (as played by Ellis Ruben) and the sparks that were undeniable between he and a young Charity (Skylar Dunn before becoming Michelle Williams) despite Charity coming from the socialite side of the tracks with a father that doesn't believe in the promise of the young Barnum we are treated to the rather touching and gorgeously rendered number that is "A Million Dreams". Against these odds and through this song, Barnum and Charity grow up, get married, and have two beautiful daughters in Caroline (Austyn Johnson) and Helen (Cameron Seely), but with Barnum's jumping from job to job he realizes he has yet to provide his family with the life he promised them as well as refusing to give up his own ambitions for himself. While much has been made of the liberties the film has taken with the real life of Barnum, primarily that of his interests in exploiting rather than empowering those he took in under his circus tent, The Greatest Showman seemingly plays it safe in most areas forcing Barnum's existence into a well-defined three-act structure rather than shaping the movie to Barnum's life in any authentic fashion. 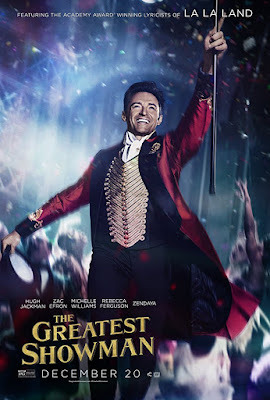 As someone only familiar with the history of Barnum through his name being on the sign of every "The Greatest Show on Earth" banner prior to its final curtain call in May of this year I won't pretend to know how well or how discouragingly The Greatest Showman adapts Barnum's intentions, but if the movie is only true to who Barnum actually was in the broadest of strokes it ultimately only serves a story that anyone who has seen even just a handful of movies over the course of their life can tell is formulaic. We watch as the movie presents Barnum as a risk-taker, someone willing to take out a loan from the bank he can't even honestly leverage to becoming a literal overnight success after buying a museum and storing stuffed animals and odd mannequins in before becoming inspired to make his theater come alive with those considered to be "freaks". As soon as Barnum's "circus", which he borrows from a scolding review by theater critic James Gordon Bennett (House of Cards' Paul Sparks), begins to take off though, Barnum's ambitions become more than that of just having "made it", but now he has to fight the battle of still being looked down upon by the social elite which then informs more conflicts, and more greed before Barnum ultimately comes to realize what's actually important in life and steps back to finally appreciate all he has built. This of course comes after nearly losing everything; his museum to a fire from angry protesters and his family to that of a will they/won't they dynamic with world-renowned singer Jenny Lind (Rebecca Ferguson) that Barnum takes on tour to make himself feel more credible. In the first number after the opening, as Barnum rounds up his outsider performer's things start out rough. Rough enough to the point that the sound mixing feels off and the singers timid as if they are just coming to the realization they are actually in a musical. As the music picks up and, in turn, so do the cuts in terms of editing for the sake of montage Jackman finds his stride and takes control of the ship as Keala Settle's Bearded Woman then joins in to solidify the confidence in the direction we're now taking. Settle, a performer who has largely been Broadway-based prior to this role, lends the whole of the production a kind of spirit that is undeniable and true. Later in the film she is given the chance to lead what is more or less the flagship song of the picture titled "This Is Me" (AKA the one featured in all of the trailers) and it is in this moment that The Greatest Showman gives up both its greatest strength and biggest weakness as a wholly original musical. While the song is undeniably catchy and the performers more than convicted in the words they are singing (the spirit of these performers, especially in this number, transcends the screen) it is the awkward staging and lack of any real building to a culminating visual that shows the lack direction from Gracey. With no reference point to the stage it's as if the filmmaker was unsure of how to make his $84 million picture visually reach the heights of the music he'd been given to work with. This is a point one can make peace with in that, could it have been better? Sure. Is it passable or done well enough? I guess. What’s not as easy to forgive is that of the fact this show-stopping number, this one with real soul, wasn’t enough to make Gracey, Bicks, or Marshall realize where their real story was. The story here is that of the outcasts that are brought in and find a home and community among one another where they’ve never felt they belonged that teaches this lesson of inclusion, but rather than stay with this narrative the film diverts itself to be more about Barnum, which is ironic considering he took the acts of others and made himself the main attraction, while crafting that other lesson around his arc. To add to this unawareness of what really makes the heart of their movie beat Bicks and Marshall add in a secondary character to Jackman in Zac Efron’s completely fictional Phillip Carlyle who is meant to show a reformed socialite that has a knack for show business and is sympathetic to Barnum’s cause. Carlyle develops a relationship with one of the trapeze artists, Anne Wheeler (Zendaya), which we are led to believe might highlight some of the ideas behind this wonderful lesson the movie is teaching, but unfortunately only turns out to be a half-baked romantic subplot that reiterates the struggle of the character most like Barnum in the film rather than that of the one who has a history with adversity. Not exploring Wheeler's feelings, but how Efron's character must cope shows a real deafness in the approach to the writing and the appeal of the story. That isn’t to say the performances aren't all they can be as, Enron and Jackman especially, are putting everything they have into this production, but the fruit of their labor simply isn’t filled with as much consistent passion as they were passionate about it. Anne Wheeler (Zendaya) makes an immediate impression on Phillip Carlyle (Zac Efron). So yeah, the story around the songs and the depiction of as much could be greatly improved by a more authentic tone and of having been placed in more capable hands, but it is the numbers themselves that are consistently impressive. Granted, there are still complaints to be logged with some of the choices made in regards to the direction of the music, but not in terms of the music itself. Pasek and Paul are keen to pen distinct tracks for each section of the film sans the aforementioned "This is Me" and the introductory ensemble piece that is "Come Alive" as the melodies somewhat run together in the aftermath, but are striking enough in the moment that your attention is held. Jackman and Efron have a solid duet that is maybe the most "musical" performance in the movie as it possesses lyrics that actually move the story forward as well as containing actual plot details, but the real highlight is seeing Efron return to the genre that gave him his big break and though his character is rather one-note his turns in the musical numbers are solid and feature a performer who seems to be re-invigorated by this choice rather than just coasting along in another raunchy R-rated comedy. Efron's second duet of the film with Zendaya, while emotionally barren due to the fact the script uses this relationship more as an instrument to make a point than hone actual affection, is probably the most beautifully choreographed of the film as it utilizes the trapeze to symbolize the push and pull of the dynamic that presently exists between the characters and the context of their would-be relationship. It is rather odd to think these two different generations of Disney-produced stars are coming together in a broad Hollywood musical as love interests, weird even, but for as lacking as the romance is in connection both bring enough heat to the moment in "Rewrite the Stars" that, again, you almost want to forgive it. Ferguson's Jenny and her unnecessary subplot get the most lifeless sequences in the film as we watch the actress essentially mime a song titled "Never Enough" that is actually sung by The Voice contestant Loren Allred. Williams' only solo moment and the most she gets to do in the film period comes courtesy of "Tightrope," a song that is highlighted by its simple elegance and placement in the film as something of a prelude to the finale that is "From Now On". "From Now On" is the number that will take the audience to church and send them home in a rousing mood. It's a fantastic moment in the movie, but the key issue with all of these is that the film is a period piece and the music feels more than contemporary which isn't overly difficult to adjust to, but is certainly jarring in the beginning. Like the music itself though, the modernisms and small detractors throughout are never explicit enough to feel intentional in the kind-of schlocky ways they come across thus leaving us with a movie that could have taken advantage of its inherent campiness, but is instead a largely cheesy affair with glimpses of genuine inspiration that push it over the edge into one of the more strangely moving experiences of the year.